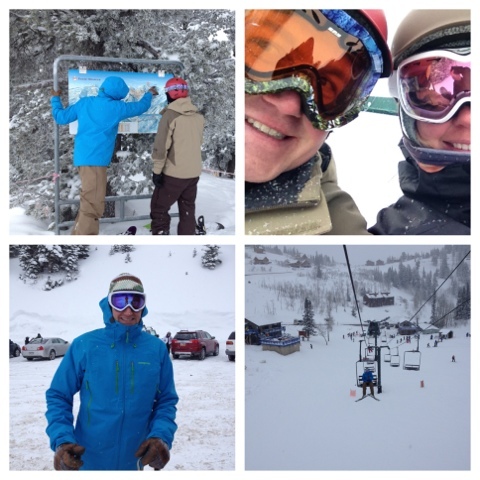 If you're just tuning in the Mr and I road tripped it to Colorado for Christmas and made a pit stop on the way home in Utah for a powder day with a good friend. It was a 36 hour whirlwind. The Thursday after Christmas we said our goodbyes to family and made our way across Wyoming to Odgen, UT located right outside of Salt Lake City. We rolled into town a bit late, but enjoyed dinner at Roosters Brewing Co. and strolled through the Christmas village on Historic 25th street before heading to Matt's casa for some wine and more good conversation. The snow gods gifted us with even more snow the next morning! 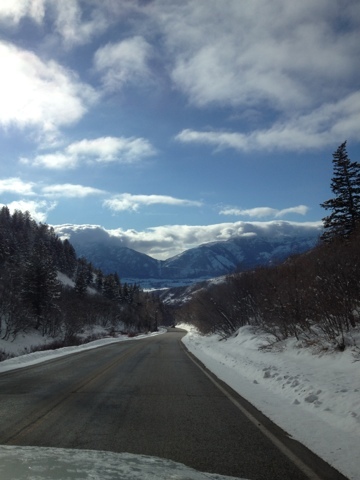 It's true what they say about Utah snow... light and fluffy. You better believe we were happy campers. Here's a shot from Matt's front porch. 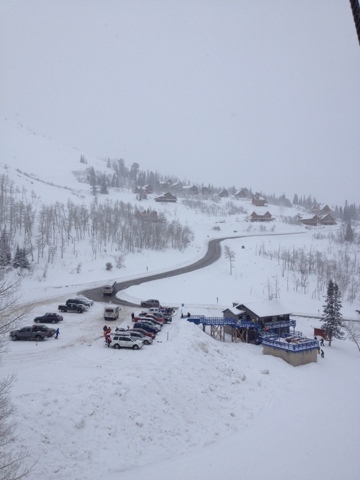 We packed up the car and headed to Powder Mountain for a PowDay. A short 20 minute drive. The day was spent riding deep powder in the trees. Oh and unlike Tahoe we had fresh tracks ALL day! It might be a small ski resort, but it was super fun. A snowy shot from the chair lift. After an epic day on the mountain we enjoyed a few slice's of pizza from The Lucky Slice. 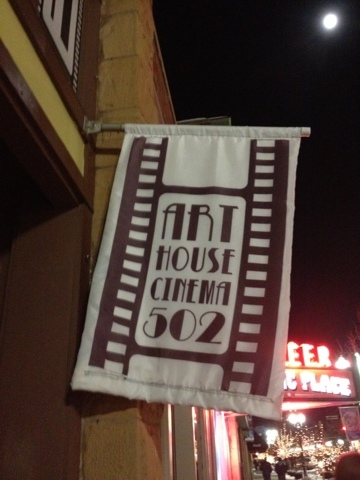 Once we finish dinner we headed to the Art House Cinema 502, a 20 seat indie theater, to watch Chasing Ice before calling it a night. It was an extremely quick trip. I wish we could have spent more time exploring downtown Odgen. It's lined with cute shops and probably tasty restaurants. Saturday we were up early and on our way back to Tahoe. Psst...Miss the other road trip posts? Check them out here, here and here. Oh... we had some snow waiting for us at home too! Lucky us we have an amazing neighbor who took care of the driveway while we were away. 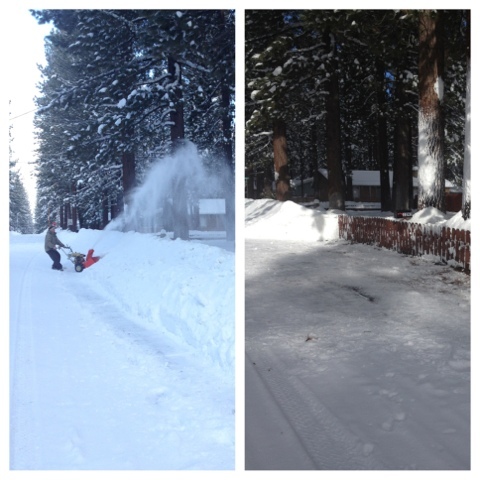 Here's the before and after shot off the snow we removed from our mail box. A snowy roof. 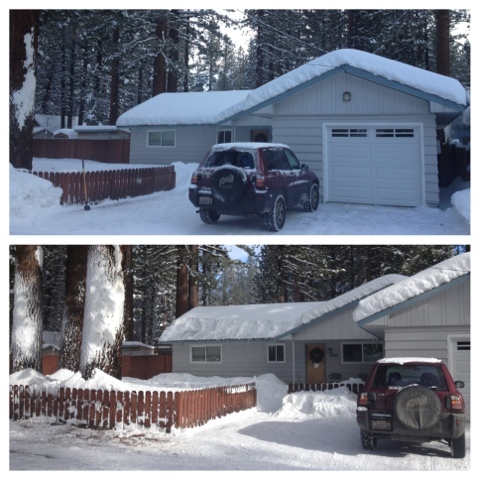 I actually used the snow roof rake for the first time! What an awesome neighbor! 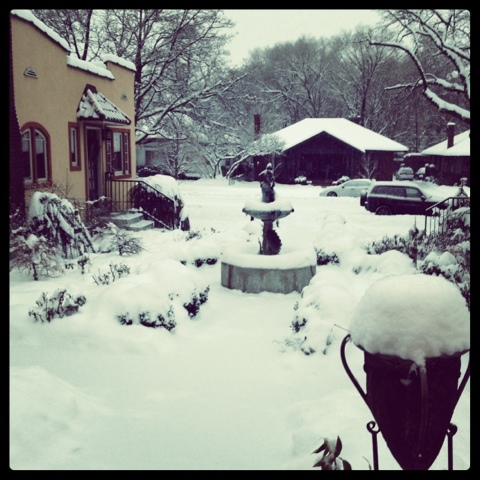 We still couldnt get over all that snow. Cullen can't wait to go up there again! welcome to utah! your blog is so cute & fun to read. You are too sweet! Thanks for the follow! Ahh, so many Christmas lights! 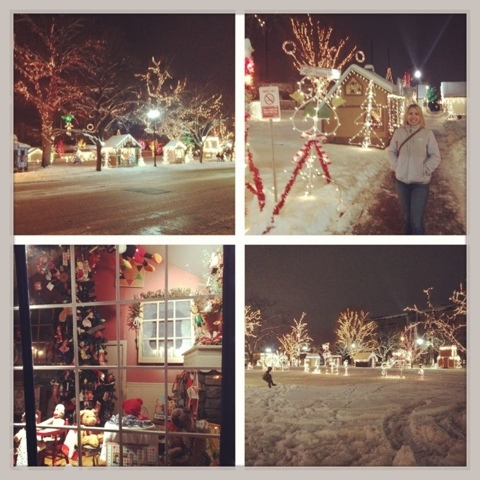 A total winter wonderland! I'm in love! It looks so cold, but so beautiful! The photo taken in the car of the road is beautiful! P.S. Thought I was already following you, but wasn't :/ Sorry about that, following now!